One of the best aspects of Insomniac’s most recent Spider-Man game is the dozens of alternate costumes from Marvel’s Spider-Man comics that you can equip in order to gain special abilities and give Peter Parker a new look. You’ve got your Spider-Punk, and your vintage comics Spidey, but let’s be honest here. The most impressive of the game’s suits is the one at the top of this page. Peter realising that he’s taken off his suit. What’s special about the Undies, though, is the gaze-y way that it makes you pay attention to and appreciate Spider-Man’s body. 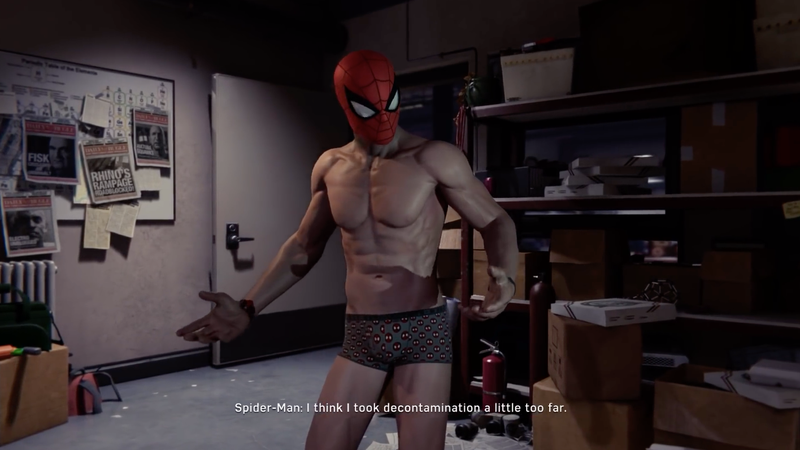 There is, of course, a certain degree of titillation that comes with seeing the hero in nothing but boxer briefs and a mask, but more than that—the suit also highlights the inhuman feats of athleticism that the radioactive spider’s bite imbued him with. Everyone knows that Spider-Man has the proportional strength of a spider, but you really get a sense of just what that means when you can see every muscle in his body working overtime to keep a runaway car from smashing into innocent bystanders. Press square to save a life.